The Mormon Dilemma is about an hour drama of a religious confrontation and dialogue between an LDS couple and their Christian neighbor. LDS Ted and Lori (some sources incorrectly name her "Carrie"--see the link at the bottom of this page, for example) are angered that their neighbor Jim's church is showing such an offensive flick as The God Makers. Jim (played by James Spencer of MazeMinistry.com) gets his LDS neighbors to simply watch the short animated clip from The God Makers (to view it, click here), and then they go back over it, section by section, in order to prove to Jim how distorted it is. Far from demonstrating how distorted it is, Ted and Lori mostly confirm its accuracy. They even reveal more details of Mormonism that alarm Jim. After Ted and Lori give Jim their take on the film, they all go into the kitchen for some punch and cookies. There Jim gets to present them what the Bible teaches about God and salvation. This is a good introductory film. It does a good job in modeling how a respectful confrontational dialogue should proceed. Jim doesn't get defensive, and doesn't come across as a know-it-all. He leaves unchallenged certain issues that Ted and Lori defend (e.g., polygamy and the pre-earth life), but Jim patiently waits for his turn to give them what he believes about God and salvation. It's nice to see a Christian portrayed who knows why he believes what he believes even if he doesn't deal with all the issues we would like for him to or even if we might disagree with some of his arguments. Jim demonstrates a particularly fine grasp on the difference between the nature of man and the nature of God. And in our modern PC age, it is certainly encouraging to watch a film (even though the film was done almost 20 years ago) in which the Christian isn't afraid to tell those he witnesses to (viz., his neighbors) that he loves them, but their "doctrines are straight from the pit of hell." 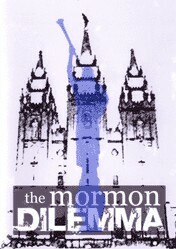 To order a copy of The Mormon Dilemma, click here.